I am steeped in bird data and migration ecology as I draft the annual report for the research permit Washington Square Park Eco Projects received to conduct a wildlife survey in the park. As soon as the report has been submitted I will post it here. I shared a list of the birds we observed in Washington Square Park earlier on in the survey period. You can find birds elsewhere in the vicinity of the park. Angus Wilson, of the Linnaean Society of New York (I did not know there was a Linnaean Society or that there was a NY chapter), published a list of songbirds sighted in the two superblock residential complexes owned by New York University. It with his permission and that of LSNY that I repost his essay below. The residential complex associated with the New York University campus includes several small areas of trees and ornamental plantings that attract a variety of songbirds during migration and in winter. The main areas are the Sasaki Garden inside the Washington Square Village complex, the LaGuardia Corner Community Garden and adjoining Time Landscape Garden that runs along the east side of LaGuardia Place between Bleecker Street and West Houston Street and the Silver Towers Oak Grove on Bleecker Street. Additional pockets of vegetation border the superblock hemmed by West 3rd Street, Mercer Street, West Houston Street and LaGuardia Place and are always worth checking especially after a migrant fall. A fenced lawn behind the University mail office is used by foraging sparrows and thrushes. Although this area lacks the observer coverage of other Manhattan parks, a good variety of species has been recorded in recent years and careful scrutiny will most likely add to this list. A female Wild Turkey frequented the area for several weeks back in 1997 and a dead Pied-billed Grebe provided a sad testament to the hazards of tall building to nocturnal migrants. The mixture of mature trees, including many native species, ground cover and water sources likely contributes to this diversity. 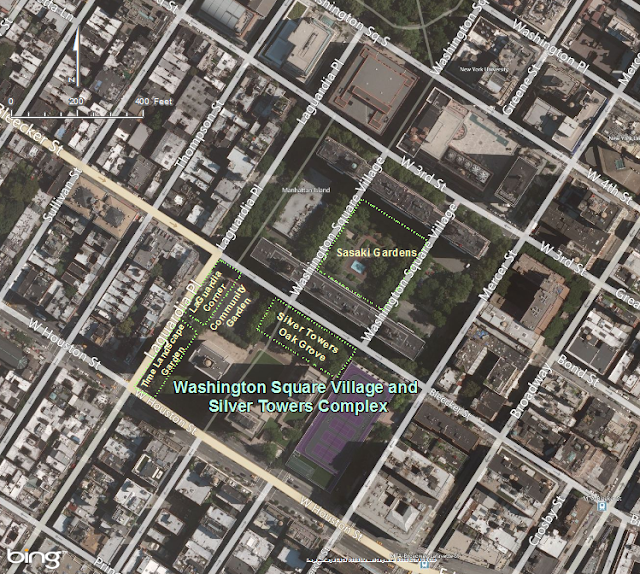 Sadly, this entire area is threatened by the NYU 2031 expansion plans that will replace most of the gardens and border strips with additional tower buildings. Fall is the optimal season for birding this area. Good numbers of White-throated Sparrows frequent the flowerbeds and are often joined by Song, Swamp and Chipping Sparrows. Dark-eyed Juncos may also be numerous. Lincoln and Fox Sparrow have occurred as rarities. The trees routinely attract Yellow-bellied Sapsuckers in the fall and winter, along with occasional Northern Flickers. The Sasaki Garden provides wintering habitat for Hermit Thrush, and in late fall, it's not unusual to encounter a dozen or more. Together with American Robins and Cedar Waxwings these attractive thrushes exploit the plantings of crabapple and cherry trees in the northern section. In flight years, the fruit of these trees has attracted Purple Finches. Additional migrants such as Blue-headed Vireo, Winter Wren, Brown Creeper, Ruby-crowned and Golden-crowned Kinglets and Eastern Towhee may also be observed. In spring, small numbers of warblers pass through but can be easily overlooked in the foliage. These have included Cape May Warbler and Chestnut-sided Warbler. One or two Wood Thrush are recorded each year. Drinking water and cut fruit are put out on the ground in the Time Landscape Garden, attracting Blue Jays and Gray Catbirds and might be worth checking for uncommon visitors. The resident Rock Pigeons and Mourning Doves attract the attention of Red-tailed Hawks, presumably coming over from nearby Washington Square Park, and American Kestrel, Merlin and Peregrine have all been seen on occasion. This is a relatively safe area, due in large part to its proximity to the University, which provides round-the-clock patrols of the area. The Sasaki Garden is closed during the hours of darkness and receives a fair amount of foot traffic during the day from residents and building employees. Be mindful of the privacy of the folks whose apartments face onto the garden. Signs forbidding photography in the gardens have disappeared and it's not unusual to see NYU film students at work in the park areas, but common sense should apply. Access to the Community Garden and Time Landscape Garden is controlled but both areas can be viewed through the fence. The area is easily reached by subway to either the West 4th Street (A B C D E F M) or Broadway/Lafayette Street (B D F M 6) subway stations, both of which are only a short walk away. Image and essay by Angus Wilson of the Linnaean Society of New York. 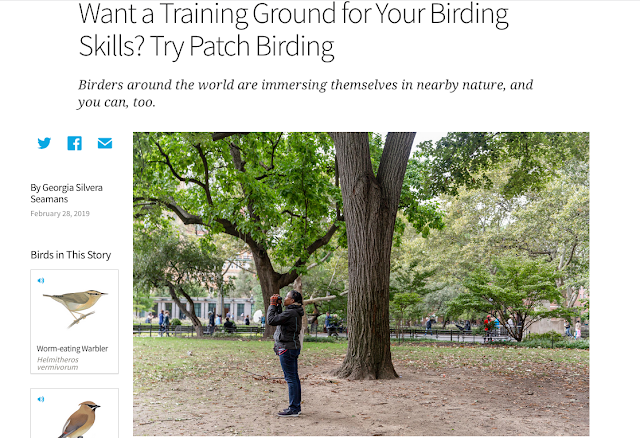 The original post, WASHINGTON SQUARE VILLAGE AND SILVER TOWERS COMPLEX, can be read at http://linnaeannewyork.org/birding-resources-rba/bird-wash-sq-vill_silver-towers.html.